From its beginnings in 1898 until its final year in 1998, Algoma Ore held a unique position in the history of iron ore mining in Canada. It was a century of great energy, strong leadership, remarkable innovation and finally tenacity. 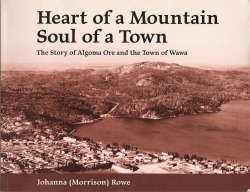 This book is a tribute to those men and women, who with their courage and indomitable spirit, came from all over the world, contributing their skills not only to Algoma, but to the building of the thriving town of Wawa, Ontario. Contact Me or use PayPal online at this local history website by G. Burns. You can also view the complete book by going to Our Roots. Signs of History - An Explorer's Guide to the Rich Heritage of the Wawa Area, is written as an easy to follow travel book, complete with maps and directions to each site. There are 28 sites of historical significance covered. The book includes old photographs and maps of each sites location. The Signs of History tour book is for both residents and visitors alike. The purpose of the booklet is to promote health & active living by encouraging the reader to physically explore the rich and colourful heritage of the Wawa/Michipicoten region. Instead of simply trying to absorb written information, the explorer is enticed to actually visit and view the sites that are significant to Wawa's unique story of growth and development in this remote corner of Northern Ontario's wilderness. Contact Me or use purchase this book online using Paypal. This book is an amazing collection of original photographs and stories written about the people, places and events that make up Wawa and the eastern shoreline of Lake Superior. Based on a number of articles researched and written for local media over the years, this book is the first in a series which bring history alive. Ancient rock art, European explorers, scientists, Groups of Seven, Glenn Gould, American business tycoons, secret blueberry patches, lighthouse keepers, mail carriers, shipwrecks and more. This book has a bit of something for everyone. You can order a customized copy for shipping directly to your door by following this link to Blurb.ca . This same link will provide you with a preview of the first few pages of the book. Costs: range from $15 to $30 depending on soft or hard cover copies and type of delivery. The most popular choice is hard cover with the dust jacket. I am excited to be able to also offer this book as an ebook for the Amazon Kindle in the Amazon.com bookstore. Even if you do not have a Kindle Reader you can download the Kindle app for free and read digital ebooks on your laptop or computer. Enjoy! I look forward to any feedback you may have on your reading experience!